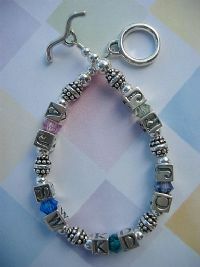 Place the 1st Initial and 2nd Initial of that special someone around their Birthstone for a very colorful look. Choose from the single strand (as shown) or a double strand for those larger families. Includes a Heart Lobster Clasp Closure and up to (8) initials per strand. Additional letters may be purchased below. Birthstones are unlimited. WHEN ADDING MULTIPLE BIRTHSTONES & INITIALS, PLEASE GIVE DETAILED INFORMATION FOR PLACEMENT IN BOX PROVIDED, BELOW.